"All the Way Up (Remix)"
"I Got the Keys" is a single by DJ Khaled, featuring American rappers Jay Z and Future. It was released on July 4, 2016 by We the Best Music Group and Epic Records as the second single of DJ Khaled's ninth studio album, Major Key. The song was produced by Southside with co-production by Jake One and G Koop. The song's music video premiered after the BET Awards on June 26, 2016. The video features cameo appearances by Rick Ross, 2 Chainz, Pusha T, ASAP Ferg, T.I., Swizz Beatz, Busta Rhymes, Fabolous, Yo Gotti, Bryson Tiller and Zoey Dollaz. ↑ "DJ Khaled (Ft. Future & Jay Z) – I Got the Keys". Retrieved 1 July 2016. ↑ Rosenberg, Adam. 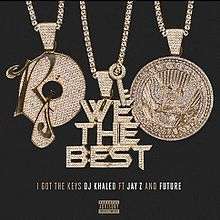 "Watch DJ Khaled's 'I Got the Keys,' featuring Jay Z and Future". Retrieved 1 July 2016. ↑ "Ultratop.be – DJ Khaled – I Got the Keys" (in Dutch). Ultratip. Retrieved July 15, 2016. ↑ "DJ Khaled – Chart history" Canadian Hot 100 for DJ Khaled. Retrieved July 13, 2016. ↑ "Le Top de la semaine : Top Singles Téléchargés - SNEP (Week 30, 2016)" (in French). Syndicat National de l'Édition Phonographique. Retrieved July 30, 2016. ↑ "Offiziellecharts.de – DJ Khaled – Holy Key". GfK Entertainment Charts. Retrieved September 10, 2016. ↑ Chart Log UK: "CLUK Update 16.07.2016 (wk28)". UK Singles Chart. Zobbel.de. Retrieved August 1, 2016. ↑ "DJ Khaled – Chart history" Billboard Hot 100 for DJ Khaled. Retrieved July 26, 2016. ↑ "DJ Khaled – Chart history" Billboard Hot R&B/Hip-Hop Songs for DJ Khaled. Retrieved July 27, 2016. ↑ "I Got the Keys (feat. Jay Z & Future)". Amazon. Retrieved July 31, 2016.